Kuhar’s has been serving its authentic Eastern European cuisine to Northeast Ohio for more than 30 years. I recently discovered Kuhar’s Arabica when a friend recommended it to me. Kuhar’s Arabica is located in Richmond Heights near the corner of Richmond Road and Wilson Mills Road. It is tucked away at the back of a strip mall behind La Fiesta. It has a couple of small tables, but they primarily focus on carry-out. There is also a carry-out store in Mentor on Broadmoor Road. Kuhar’s is open Monday through Saturday from 11 a.m. to 8 p.m. I have stopped here twice and look forward to frequenting it more often. The first time I ordered the House Platter, which features a combination platter of Wiener Schnitzel, Paris Schnitzel and smoked sausage served with sauerkraut, choice of potato (I ordered mashed) a side salad and a slice of soft white bread for only $11.75. Having lived in Salzburg, Austria for a year and Germany for six years I know my Schnitzel. 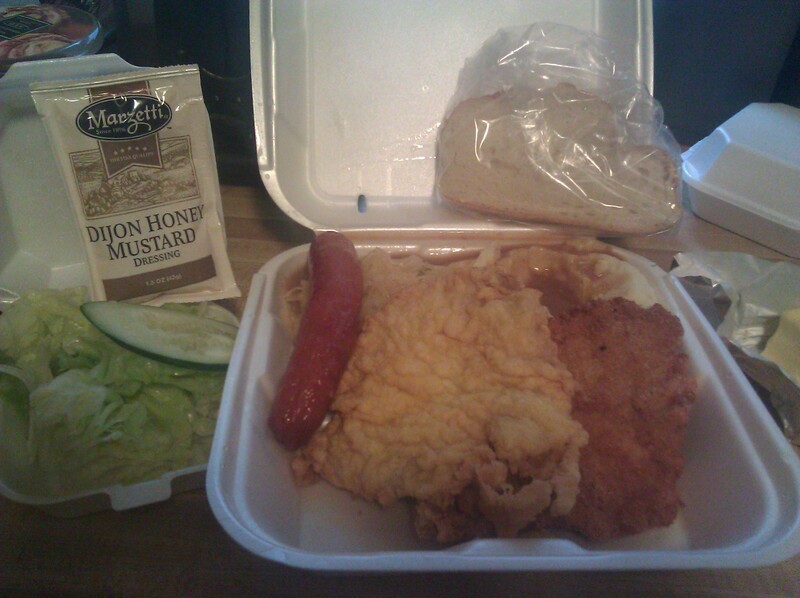 This is among the best Schnitzel I have found in Cleveland. Pounded thin with a light coating of breading, this Schnitzel was delicious. I couldn’t decide which of the two I liked better, because they were both excellent. The sausage was also quite good, and the sauerkraut was soft and silky and not too bitter. They serve specials every day, and I have been looking forward to trying their Tuesday special, stuffed cabbage. It isn’t as “tomatoey” as Sokolowski’s stuffed cabbage, but this stuffed cabbage was delicious. The meat and rice filling was perfectly seasoned, and the cabbage and sauerkraut were not overpowering. I once again ordered the mashed potatoes and got a side of peas and carrots with my meal. 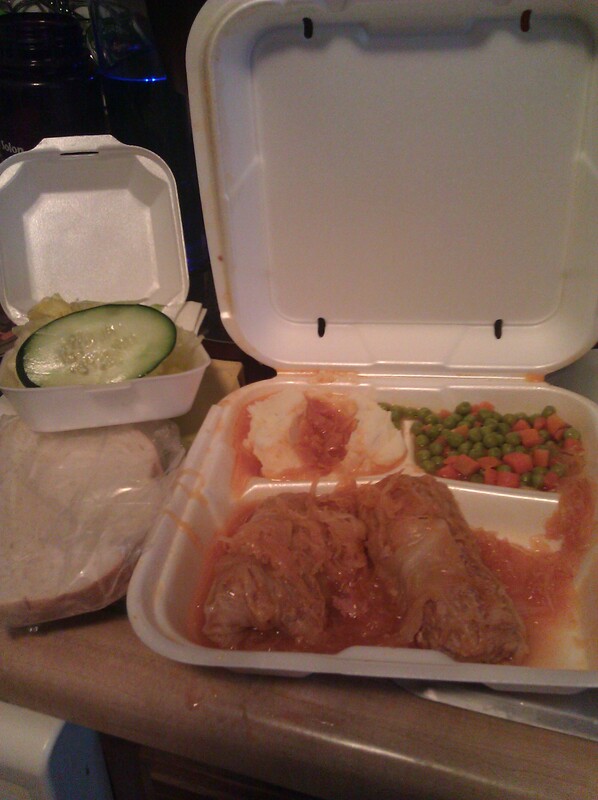 For only $8 I received two reasonably sized stuffed cabbages, a generous scoop of mashed potatoes and stuffed cabbage gravy, peas and carrots, a side salad and a slice of their white bread. Yum! And even though I am not a huge fan of peas and carrots these weren’t half bad. I can’t wait to try the St. Moritz Schnitzel and the Goulasch, and I have a good friend/fellow German translator who will be thrilled to hear about their Rouladen. It’s her favorite, and I plan to surprise her with an order of it at her baby shower in a few days. But I would be remiss if I didn’t mention their desserts. They offer a special dessert every day as well as strudel. I had the choice of apple, cherry or cheese strudel. 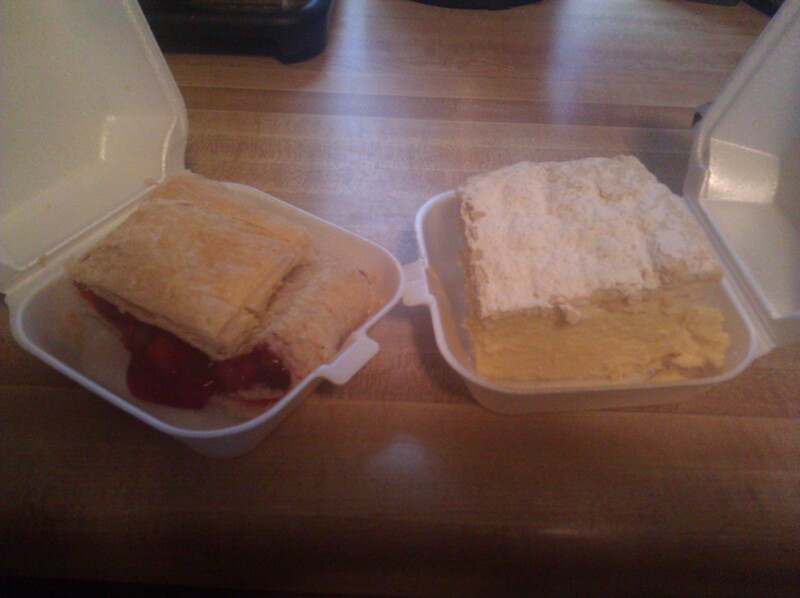 I ordered both the cherry strudel for $2.25 and the custard square for $2.95 to share with my friend the first day. The strudel was delicious. Flaky and light with a delicious filling. I am usually pretty picky when it comes to strudel (again, living in Austria will do that…), but this strudel is again some of the best I’ve had in Cleveland. Usually the strudel here is a little tough and difficult to cut with a fork. Not this strudel! The custard square was also absolutely divine. The custard held up well and wasn’t too runny, and the pastry dough was flaky and delicious. I love when people review strip mall restaurants! I don’t normally visit them unless I’ve heard a good review. I rarely eat Eastern European food so this would be great for something different! I agree! But I let others risk it before I go, too many aren’t worth it. Your facebook post got me to try it two weeks ago, and I can’t wait to get back! I had the Chicken Paprikash and it was very good. 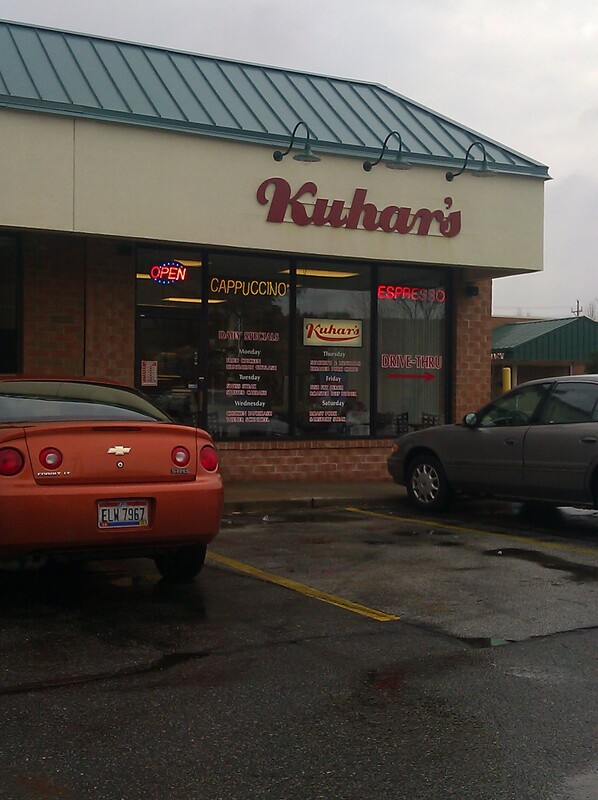 Wow, I really miss Kuhar’s. I’m glad you finally got a chance to try it. I’d always wanted to get the Mystery book group there for coffee and dessert beforehand. I especially miss the custard bars. I’m glad you told me about it, G.